Phidias, one of the greatest sculptors the world has seen, and whose name has become, as it were, the synonym of his art, was born at Athens about 500 B.C. He belonged to a family of artists, none of whom indeed were distinguished in their profession, but their varied occupations furnished the atmosphere in which such a talent as that of Phidias could best be fostered and brought to maturity. His father was Charmides, who is believed to have been an artist, because the Greeks, in their inscriptions, did not associate the name of the father with that of the son unless both were of the same calling. A brother of Phidias, Panoenos, was a painter, and is mentioned among those artists, twenty or more in number, who in conjunction with Polygnotus, one of the chief painters of his day, were employed in the decoration of the Poecile or Painted Portico, one of the many beautiful buildings erected by Cimon. The Poecile was simply a long platform, with a roof supported by a row of columns on one side and by a wall on the other. It was called "the painted," because the wall at the back was covered with a series of large historical pictures containing many figures, and recording some of the chief events of the time, together with others relating to an earlier and more shadowy epoch. The subject of the painting, executed, at least in part, by the brother of Phidias, was the Battle of Marathon, in which great event it is thought he may himself have taken part. The boyhood of Phidias fell in a time of national revival, when under the influence of an ennobling political excitement, all the arts were quickened to a fresh, original, and splendid growth. The contest between the Greeks and Persians, which had begun with the Ionian revolt, was in full activity at the time of his birth. He was ten years old when the battle of Marathon was fought, and when he was twenty, four of the most striking events in the history of Greece were crowded into a single year; the battle of Thermopylae, the victory at Salamis, and the twin glories of Plataea and Mycale. His early youth, therefore, was nourished by the inspiring influences that come from the victorious struggle of a people to maintain their national life. He was by no means the only sculptor of his time whom fame remembers, but he alone, rejecting trivial themes, consecrated his talent to the nobler subjects of his country's religious life and the ideal conception of her protecting gods. No doubt, Phidias, like all who are born with the artistic temperament, would be interested from childhood in the progress of the splendid works with which Athens was enriching herself under the rule of Cimon. But his interest must have been greatly increased by the fact that his brother Panoenos was actively engaged in the decoration of one of those buildings. It would be natural that he should be often drawn to the place where his brother was at work, and that the sight of so many artists, most of them young men, filled with the generous ardor of youth, and inspired by the nature of their task, should have stirred in him an answering enthusiasm. It gives us a thrill of pleasure to read in the list of these youths the name of the great tragic poet, Euripides, who began life as a painter, and in whose plays we find more than one reference to the art. It cannot be thought unreasonable to suppose that two such intelligences as these must have had an attraction for one another, and that, as in the case of Dante and Giotto, the great poet and the great artist would be drawn together by a likeness in their taste and aims. 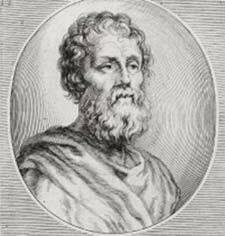 Phidias studied his art first at Athens, with a native sculptor, Hegias, of whom we know nothing except from books. Later, he went to Argos, and there put himself under the instruction of Ageladas, a worker chiefly in bronze, and very famous in his time, of whom, however, nothing remains but the memory of a few of his more notable works. For us, his own works forgotten, he remains in honor as the teacher of Myron, of Polycletus, and of Phidias, the three chief sculptors of the next generation to his own. On leaving the workshop of Ageladas, Phidias executed several statues that brought him prominently before the public. For Delphi, he made a group of thirteen figures in bronze, to celebrate the battle of Marathon and apotheosize the heroes of Attica. In this group, Miltiades was placed in the centre, between Athena, the tutelary goddess of Athens, and Apollo, the guardian of Delphi; while on each side were five Athenian heroes, Theseus and Codrus with others, arranged in a semicircle. This important work was paid for by Athens out of her share in the spoils of Marathon. Another important commission executed by Phidias was a statue of Athena made for her temple at Plataea, and paid for with the eighty talents raised by the contributions of the other Grecian states as a reward for the splendid services of the Plataeans at Marathon, where they played somewhat the same part as the Prussians at the battle of Waterloo. The head, hands, and feet of this statue were of marble, but the drapery was of gold; so arranged, probably, as in the case of the great statue of Athena designed later by Phidias for the Parthenon, as to be removable from the marble core at pleasure. Phidias made so many statues of the virgin goddess Athena, that his name became associated with hers, as at a later day that of Raphael was with the Virgin Mary. In the first period of his artistic career, moved perhaps by his patriotic gratitude for her intervention in behalf of his native state, he had represented the goddess as a warlike divinity, as here at Plataea; but in his later conceptions, as in a statue made for the Athenians of Lemnos, Athena appeared invested with milder attributes, and with a graceful and winning type of beauty. In their invasion of Attica the Persians had destroyed the city of Athens, and the people, who had fled to all quarters of the peninsula to seek refuge from the enemy, returned after the victory at Salamis and the flight of the Persians, to find their homes a heap of ruins. The dwelling-houses of the Greeks were everywhere, even in their largest cities, built of mean materials: walls of stubble overlaid with stucco and gayly painted. It was not long, therefore, before Athens resumed something of her old appearance, with such improvements as always follow the rebuilding of a city. The most important change effected was that brought about in the character of the great plateau, the fortified rock of the Acropolis. Here, as in many Greek cities, the temples of the gods had been erected, and about them, as about the cathedrals of the Middle Ages, there had grown up a swarm of houses and other buildings built by generations of people who sought there at once the protection of the stockade which enclosed the almost inaccessible site, and the still further safeguard of the presence of the divinities in their temples. The destructive hand of the Persian invaders had swept this platform clear of all these multiplied incumbrances, and in the rebuilding of the city it was determined to reserve the Acropolis for military and religious uses alone. The work of improvement was begun by Cimon, who, however, confined his attention chiefly to the lower city that clustered about the base of the Acropolis. Here, among other structures, he built the temple of Theseus and the Painted Portico, and he also erected, near the summit of the Acropolis, on the western side, the little gem-like temple of the Wingless Victory, Nike Apteros, in commemoration of the success of the Athenian arms at the battle of the Eurymedon. It was from Cimon that Phidias received his first commission for work upon the Acropolis, where later he was to build such a lasting monument to his own fame and to the fame of his native land. The commission given him by Cimon was to erect a bronze statue of Athena which was to stand on the citadel, at once a symbol of the power of Athens and a tribute to the protecting goddess of the city. The work upon the statue was probably begun under Cimon, but according to Ottfried Mueller it was not completed at the death of Phidias. It stood in the open air, and nearly opposite the Colonnade at the entrance of the great flight of marble steps that led from the plain to the summit of the Acropolis, and was the first object to meet the eye on passing through the gateway. It represented the goddess, armed, and in a warlike attitude, from which it derived its name, Athena Promachos: Athena, the leader of the battle. With its pedestal it stood about seventy feet high, towering above the roof of the Parthenon, the gilded point of the brazen spear held by the goddess flashing back the sun to the ships as in approaching Athens they rounded the promontory of Sunium. We read that the statue was still standing so late as 395 A.D., and it is said that its towering height and threatening aspect caused a panic terror in Alaric and his horde of barbarians when they climbed the Acropolis to plunder its temple of its treasure. But it was under the rule of Pericles that Phidias was to find at Athens his richest employment. Pericles had determined, probably by the advice of Phidias, to make the Acropolis the seat and centre of the new and splendid city that was to arise under his administration. The first great undertaking was the building of a temple to Athena Parthenos, Athena the Virgin, a design believed to have been suggested to Pericles by Phidias. The plans were intrusted to Ictinus, an Athenian, one of the best architects of the day; but the general control and superintendence of the work were given to Phidias. As the building rose to completion, workmen in all branches of the arts flocked to Athens from every part of Greece and were given full employment by Phidias in the decoration and furnishing of the temple. The taste of Phidias controlled the whole scheme of decoration applied to the building, into which color entered, no doubt, to a much greater extent than was formerly believed. Even after time and the destructive hand of man have done their worst, there still remain sufficient traces of color to prove that the sculpture, and the whole upper part of the temple, were painted in bright but harmonious colors, and that metal ornaments and accessories accented the whole scheme with glittering points of light reflected from their shining surfaces. The sculptures with which the Parthenon was adorned by Phidias, and which were executed under his immediate superintendence, consisted of two great groups that filled the eastern and western pediments; of groups of two figures each in the ninety-two metopes or panels above the outer row of columns; and, finally, the famous frieze that ran completely round the temple itself, just below the ceiling of the colonnade, and at a height of about thirty-nine feet from the floor. The subject of the group that filled the eastern pediment, the one above the entrance door of the temple, was the birth of Athena. Just how the event was represented we do not know because quite half the group, including the principal figures, disappeared very early in our era, and no description of them remains in any ancient or modern writer. The group in the western pediment represented the contest between Athena and Poseidon for the dominion over Attica. According to the legend, the strife between the two divinities took place in an assembly of the gods on the Acropolis, who were to determine which of the two contestants should be the protector of the city. To prove his power, Poseidon struck the rock with his trident, and a salt spring leaped forth, as if the sea itself had obeyed the call of its lord. Athena struck the ground, and an olive-tree sprang up, the emblem of peace and of the victories of commerce, and the assembly awarded the prize to her. The goddess having thus received the sovereignty of Athens, it was but natural that a day should be set apart for her special honor, and a festival instituted to commemorate the great event. This was the greater Panathenaia, or All Athenians Day, which was celebrated every fourth year in honor of the goddess, and which, as its name implies, was taken part in by all the people of the city. It occurred in the early summer and lasted five days. On the fifth day, it closed with a procession which went through all the chief streets of the city and wound its way up the Great Stairway to the Acropolis, bearing the peplos or embroidered robe woven by young virgin ladies of Athens, chosen from the highest families, and known for their skill in this kind of work. After the peplos had been consecrated in the temple it was placed with due solemnities upon the ancient and venerable figure of the goddess, made of olive-wood, and said to have descended from heaven. From its subject, which thus celebrates the Panathenaic procession, the frieze is often called the Panathenaic frieze. It is carved from Pentelic marble, of which material the marble building is constructed. Its original length, running as it did around the entire building, was 522.80 feet, of which about 410 feet remain. Of this portion, 249 feet are in the British Museum in slabs and fragments; the remainder is chiefly in the Louvre, with scattered fragments in other places. As a connected subject this was the most extensive piece of sculpture ever made in Greece. From all that can be gathered from the study of the fragments that remain, the design of the frieze was of the utmost simplicity and characterized by the union of perfect taste and clear purpose that marks all the work of the great sculptor. The subject begins in the frieze at the western end of the temple, where we watch the assembling of the procession. It then proceeds along the northern and southern sides of the building, in what we are to suppose one continuous line, moving toward the east, since all the faces are turned that way; and at the eastern end, directly over the main entrance to the building, the two parts of the procession meet, in the presence of the magistrates and of the divinities who had places of worship in Athens. Of the grace, the skill in arrangement, the variety of invention, the happy union of movement and repose shown in this work, not only artists--men best fitted to judge its merits from a technical point of view--but the cultivated portion of the public, and a large and ever-increasing circle of every-day people, have by common consent agreed in praise. By the multiplication of casts, to be found now in all our principal museums, we are enabled to study and to enjoy the long procession even better than it could have been enjoyed in its original place, where it must have been seen at a great disadvantage in spite of the skill shown by Phidias in adapting it to its site; for, as the frieze stood thirty-nine feet from the floor, and as the width of the portico between the wall and the columns was only nine feet, it was seen at a very sharp angle, and owing to the projection of the roof beyond the wall of the temple the frieze received only reflected light from the marble pavement below. Apart from the marble sculptures on the exterior of the Parthenon, the two most famous works of Phidias were the statues of Athena, made for the interior of the Parthenon, and of Zeus for the temple of the god at Olympia in Elis. Both these statues were of the sort called Chryselephantine, from the Greek chrousous, golden, and elephantinos, of ivory; that is, they were constructed of plates of gold and ivory, laid upon a core of wood or stone. The style was not new, though its invention was at one time ascribed to Phidias. It came from the East, but it was now employed for the first time in Greece in a work of national importance. In the Athena, the face, neck, arms, hands, and feet were made of ivory, and the drapery and ornaments, the helmet, the shield, and the sandals of gold, which as in the case of the statue made for Plataea, was removable at pleasure. The height of the statue, including the pedestal, was nearly forty feet. The goddess stood erect, clothed with a tunic reaching to the ankles, and showing her richly sandalled feet. She had the aegis on her breast, her head was covered with a helmet, and her shield, richly embossed with the Battle of the Amazons, rested on the ground at her side. In one hand she held a spear, and in the other, an image of Victory six feet high. A still more splendid work, and one which raised the fame of Phidias to the highest point, was the statue of the Olympian Zeus, made for the Eleans. In this statue, Phidias essayed to embody the Homeric ideal of the supreme divinity of the people of Greece sitting on his throne as a monarch, and in an attitude of majestic repose. The throne, made of cedar-wood, was covered with plates of gold, and enriched with ivory, ebony, and precious stones. It rested on a platform twelve feet high, made of costly marble and carved with the images of the gods who formed the council of Zeus on Olympus. The feet of the god rested on a footstool supported by lions, and with the combat of Theseus and the Amazons in a bas-relief on the front and sides. In one hand Zeus held the sceptre, and in the other a winged Victory. His head was crowned with a laurel wreath; his mantle, falling from one shoulder, left his breast bare and covered the lower part of his person with its ample folds of pure gold enamelled with flowers. The whole height of the statue with the pedestal was about fifty feet; by its very disproportion to the size of the temple it was made to appear still larger than it really was. This statue was reckoned one of the wonders of the world. In it the Greeks seemed to behold Zeus face to face. To see it was a cure for all earthly woes, and to die without having seen it was reckoned a great calamity. The downfall of Pericles, due to the jealousies of his rivals, carried with it the ruin of Phidias, his close friend, to whom he had entrusted such great undertakings. An indictment was brought against the sculptor, charging him with appropriating to himself a portion of the gold given him for the adornment of the statue of Athena; and according to some authorities Pericles himself was included in the charge. The gold had, however, been attached to the statue in such a manner that it could be taken off and weighed, and in the proof, the charge had to be abandoned. But Phidias did not escape so easily. He was accused of sacrilege in having introduced portraits of himself and Pericles on the shield of the goddess, where, says Plutarch, in the bas-relief of the Battle of the Amazons, he carved his own portrait as a bald old man lifting a stone with both hands, and also introduced an excellent likeness of Pericles fighting with an Amazon. Phidias died in prison before the trial came off, and his name must be added to the long list of those whom an ungrateful world has rewarded for their services with ignominy and death.